Before going to my recipe for today, I want to take this chance to share with you about a meaningful campaign in which I am taking part. If you are a Foodbuzz Featured Publisher, you may have already heard that Foodbuzz has partnered with Yahoo! who is donating $20,000 to Share Our Strength on behalf of the entire Foodbuzz community and all the people who make Yahoo! their homepage. *more than 17 million kids in America are at risk of hunger. That’s nearly 1 in 4. *15.5 million kids in America live in poverty. *19 million kids get a free or reduced-price school lunch on an average school day. *Just 1 in 6 eligible kids get free summer meals. Join me and support Yahoo!’s $20,000 commitment to an organization working to find a solution to all these! Share Our Strength is a nonprofit organization which through partnerships with public officials, community and faith-based organizations, and private-sector leaders at the state and city level, connect kids to programs that can help provide the food they need. It is dedicated not only to ending childhood hunger in America, but in making sure that children don’t just have enough to eat, but that they are getting the nutrition they need to learn, grow and thrive. 1. Make Yahoo! your homepage now by clicking on this link. 3. 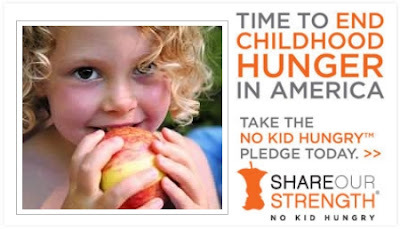 Check out Share our Strength’s website to learn more about what you can do to end childhood hunger. Together we can do this! Every simple thing you do counts! 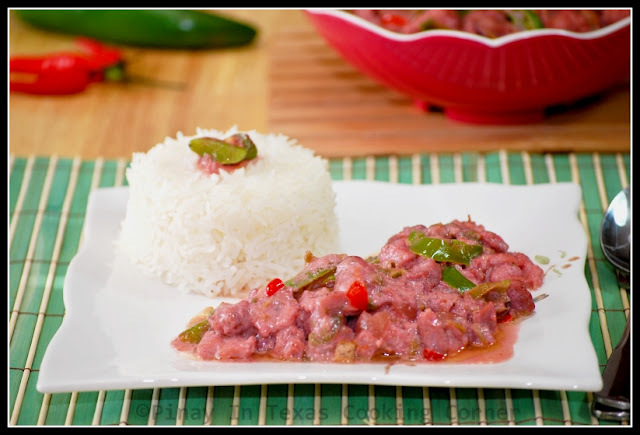 Every region in the Philippines has its own unique specialty dish which are mostly not too spicy, except for the Bicol Express which is the specialty dish of the Bicolanos from South Luzon. 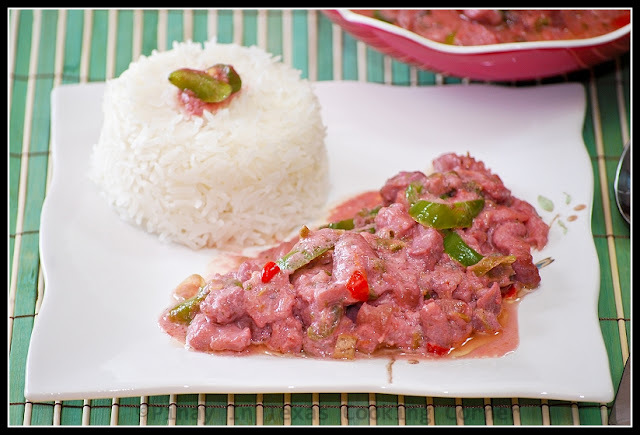 Also known as sinilihan (which means made with chillies), Bicol Express which is basically pork strips and finger chillies cooked in coconut milk, is known to be the spiciest Filipino dish. I was introduced to this dish by my Bicolano friends when I was in college. 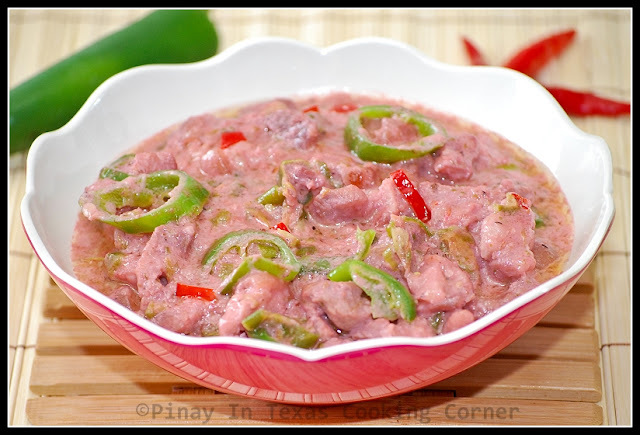 They said this dish is called Bicol Express because it makes you run for water like an "express train" as soon as it touches your tongue because it is really spicy. 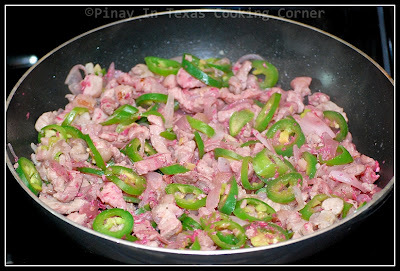 The original Bicolano version makes use of siling labuyo (bird's eye chili) which makes it really hot. And unlike my version, it has less or no coconut milk at all and it actually has more chillies than pork. 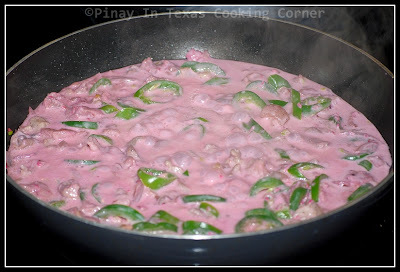 I love spicy food, but my obsession with hot peppers isn't as much as that of the Bicolano’s and I want to be able to appreciate the flavors in the dish, and not mask it with heat, so my Bicol Express is a milder version. I couldn't find siling labuyo here so I used a combination of Thai chillies, Jalapeño pepper as well as Korean pepper instead. I also removed the seeds of the Thai chillies. It may still be hot for some, but for me and Ryan, it's just right. You can adjust the amount of chillies you use depending on your liking. 1. 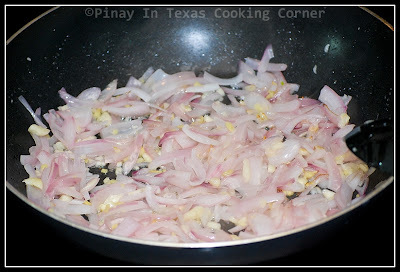 In a large skillet or wok, sauté garlic, onion and ginger in vegetable oil until onion is almost translucent. 2. Add pork and sauté until it is no longer pink. 3. Add shrimp paste and half of the Korean pepper, Jalapeño pepper and green onions. Saute for a minute. 4. Add coconut milk & fish sauce. Bring to a boil. Simmer until pork is tender. 5. Add salt and pepper to suit your taste. Add Thai chillies and remaining Korean pepper, Jalapeño pepper and green onions. Simmer for 3 more minutes. 6. Remove from heat. Serve hot with steamed rice. 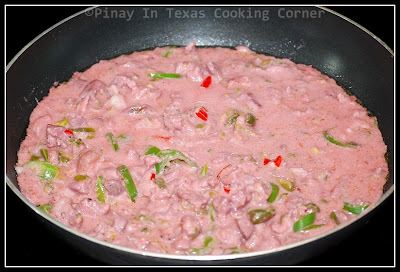 Note: The pink color of my Bicol Express is due to the Shrimp Paste I used. One of my all time favorite dishes. I love it with coconut milk. Bicol Express is comfort food for me and my daughter. Thanks for the recipe and step by step pics! Oh! one of my favorites! I should try this here! Oh My DEAR! that looks really good. I am not a big fan of pork can I substitute it with chicken or beef? and which part of Texas are you currently reside? I live in Irving. How about you? @Gria: Thanks for dropping by! 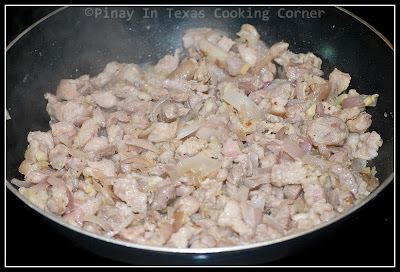 I've tried using chicken breast for my Bicol Express and it tasted equally good. Haven't tried using beef, but I'm sure it will work well too! @Rachel Joy: You're right, my friend from Bicol told me that the authentic Bicol Express doesn't have shrimp paste. I don't get to cook so much with bagoong but seeing it always whets my appetite. I don't like it too spicy, either. I find that that just numbs all my taste buds and I can't taste anything else. Lovely with rice, lots of it. I love spicy food, this looks so good! Ooooh love that kick from the Thai chilis! Sounds delicious! Love all the ingredients there. This dish must be very good with rice...mmm. The colour is beautiful. Love that you added coconut milk. I can just imagine the lovely aroma. Thanks very much for sharing. That looks sooo appetizing, Tina! I love the saltiness of bagoong and the richness of gata, combined. More chillis on mine please. Thank you for sharing this wonderful dish. 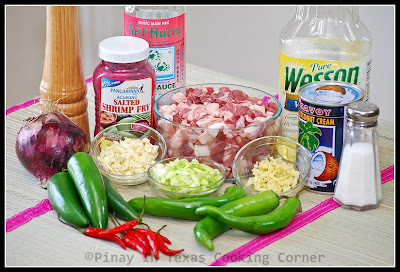 That is one of my favorite Filipino dishes. They cook it even with coconut oil that is made spicy. Wow, this looks really delicious. Thank you for sharing this recipe. Thai chili can be used in different dishes.